Iceland has more than two dozen active volcanoes. Legend says that a magician once swam to Iceland in the form of a whale, hoping to bring the isolated North Atlantic island under his spell. But when he reached Iceland’s rocky shores, he abandoned his dream upon discovering that it was already inhabited by spirits who fiercely defended their lush green meadows, frigid ice sheets, and soaring volcanic mountains. In Iceland: Fire and Ice, NATURE takes an inspiring look at the real spirits — both human and wild — that thrive in a challenging land where fire literally meets ice. Iceland: Fire and Ice offers a stunning portrait of this island of extremes, where some of Europe’s biggest glaciers cozy up to some of the continent’s hottest volcanic springs. And it profiles many of the remarkable animals, such as birds from the lethal gyrfalcon to the comic, clown-billed puffin, that bring vibrant life to an occasionally desolate landscape. To Iceland’s earliest human settlers, who arrived from Europe sometime in the 9th century, the island’s ruggedly beautiful lava flows, smoking volcanic vents, and roaring waterfalls seemed inconceivably ancient. Some imagined them to be the sculpted remains of some timeless battlefield, where their immortal gods had waged a merciless war. In fact, however, Iceland is a mere child in geologic terms. It was formed by volcanic eruptions just 20 million years ago, as magma poured from the Mid-Atlantic Ridge, a tear in the seabed that marks the boundary between the North American and European continental plates. As the liquid rock oozed out of the tear and cooled, it produced the island we see today: a 300-mile-long, 200-mile-wide oval landmass that sits between Greenland and the European coast in the icy seas near the Arctic Circle. But Iceland’s construction is far from over. 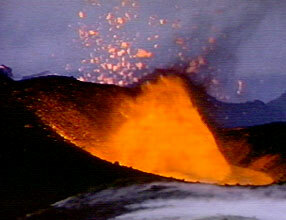 Today, it boasts more than two dozen active volcanoes that regularly erupt and add more lava and ash to the landscape. Indeed, Icelanders experience an eruption twice a decade on average, with the scenic Mount Hekla being one of the island’s most energetic volcanoes in recent years. While eruptions often consist of little more than a spit of smoke and a cough of ash, sometimes they can mean spectacular and dangerous geologic fireworks. In the late 18th century, for instance, Iceland’s Mount Lakagigar produced the world’s largest lava flow — more than 3 cubic miles of molten rock. Thousands of farm animals were gassed to death by the mountain’s poisonous fumes, and the eruption produced so much ash that the sky was dark for weeks. The eruption wreaked havoc on the island’s food supply, causing a famine; more than a third of Iceland’s people died. Vulcanism is not only one of Iceland’s hallmarks; it is also responsible for the island nation’s best-known contribution to other languages.The word “geyser” comes from a single celebrated spring in southwestern Iceland that every so often flings its waters, heated to boiling by the volcanic magma below, several hundred feet into the air. Today, volcanic fountains all over the world carry the name given to this Icelandic wonder, which has become less active in recent years. But many other hot springs continue to provide Icelanders with an important source of energy — and natural saunas perfect for a winter warm-up. Volcanic fire isn’t the only elemental force shaping the island. Ice, too, plays a key role. Less than 8,000 years ago, geologists believe the entire island was buried beneath miles of ice. As these massive glaciers melted away, they carved Iceland’s remarkable steep-sided valleys and fjords, long, narrow glacial valleys that have been flooded by the sea. Today, ice continues to carve and smooth the land. About ten percent of the island is covered by glaciers. The largest, called Vatnajokull, is already more than a half-mile deep and covers about 3,000 square miles. It is Europe’s largest glacier. Indeed, all of the continent’s other ice caps would comfortably fit within Vatnajokull. But the massive ice sheet isn’t Iceland’s only record-breaker. The island also boasts the continent’s largest and most powerful waterfall: the Gullfoss, or “Golden Falls.” Once, government planners had considered the 105-foot cascade a perfect place to build a hydroelectric dam. But folklore says a young woman threatened to throw herself over the falls if plans to destroy the natural monument went forward. Her threat worked, and today the site is protected by a national park. So, on a sunny day, the Gullfoss continues to sparkle with countless rainbows, drawing thousands of onlookers each year to view the spectacle. Like the early settlers before them, they can only marvel at the natural beauty crafted by the unlikely union of fire and ice. A Co-Production of Thirteen/WNET New York and BBC-TV.